Although strong, versatile and in many cases less expensive than cotton, the synthetic material polyester does have one downfall: its inability to withstand direct heat. This can make it difficult to iron out the wrinkles from your polyester pants, top or dress without leaving behind an unsightly scorch mark. 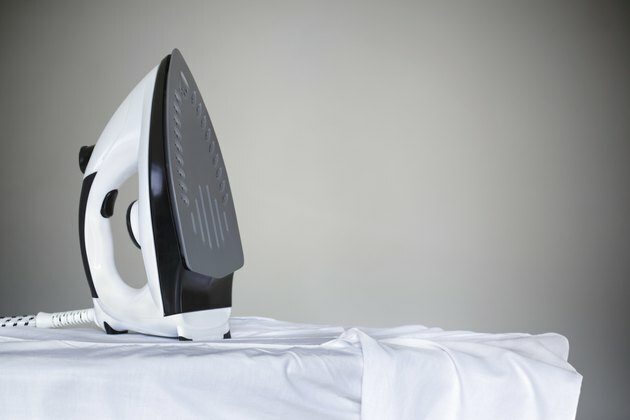 Removing the wrinkles with steam is a safer alternative. Hang the polyester garment on a sturdy, plastic or wooden hanger. Avoiding using a metal hanger, as rust can transfer onto your garment. Suspend the hanger from a sturdy spot inside your bathroom that's near the shower, but avoid hanging the garment inside the shower. Mix 1 tablespoon of liquid fabric softener and 3 cups of plain water in a plastic spray bottle. Shake up the mixture before spraying it lightly on the garment. The diluted fabric softener will help release the wrinkles, while leaving behind a pleasant odor. Turn on the shower to the hottest setting, leave the shower curtain or doors open, and shut the bathroom door. The steam from the room will safely and effectively remove the wrinkles without damaging the polyester. Enter the steamy bathroom after 10 to 15 minutes. If the wrinkles are eliminated, remove the garment and store or wear as needed. If deeper wrinkles persist, leave the shower on, shut the bathroom door and gently tug on the wrinkled areas until they are gone. Read the garment's label to ensure that it's safe to place in a dryer. If so, set the dryer to the label's recommended heat setting. Hang up the polyester garment or a plastic or wooden hanger and gently spritz it with a plastic spray bottle filled with plain water, or a combination of 1 tablespoon of liquid fabric softener diluted in 3 cups of plain water. Either is acceptable to help soften the fabric and eliminate the wrinkles. Place the garment and a single damp hand towel inside the dryer. Turn on the dryer and allow it to run for 10 to 15 minutes. The combination of the damp polyester garment, damp towel and dryer's heat creates a steam that helps safely and gently eliminate wrinkles. Turn off the dryer and examine the garment after 10 to 15 minutes. If some deeper wrinkles persist, run the garment and towel for an additional 10 minutes. If you're satisfied, wear or store the garment as desired. Do not steam the polyester piece if the garment's label warns against placing it inside a dryer.